One of the more common questions from CC3+ users is about how to extract a region from a large-scale map and develop this region as a more detailed local map. The basics for doing this is already explained in the User Manual that comes with CC3+, but for this article, I am going to go a bit more into detail and explain the various tools and processes involved in doing this. The basic principles behind this operation is to create a new map of the desired size, then copy over the entities from the existing map, trim down these entities to fit the new map size, and finally add additional detail to the new local map. Let us explore the tools and procedure for doing this. The main tools you’ll need for doing this is Clipboard Copy, Trace, Break and Split, as well as some minor Node Editing. Let us get started. For this article, I’ll use the example map from the User Manual. You’ll find this map in @Tutorials\UserManual\Example.fcw (remember that the @-sign refers to your CC3+ data directory). 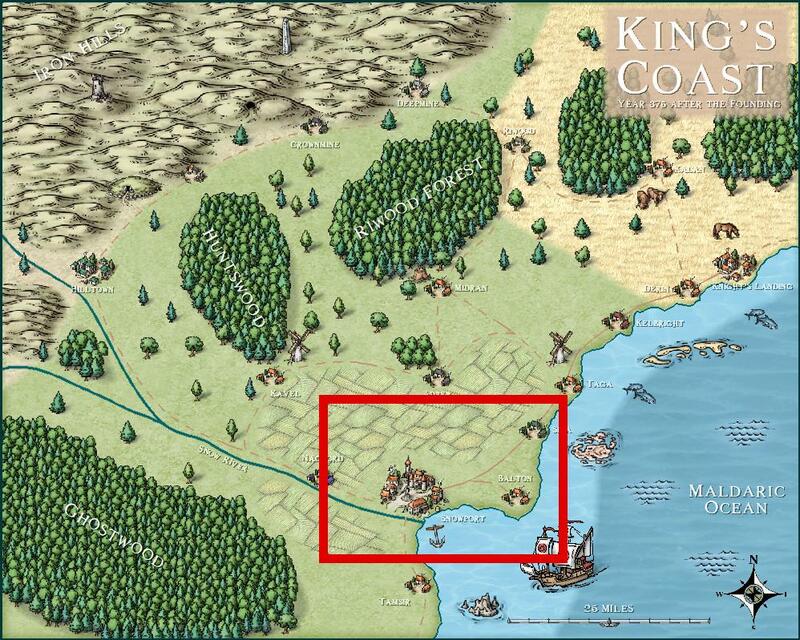 My goal is to take the area marked with the red rectangle and develop that into a local map of that area. The marked area here is 30 by 20 miles. Note that all images in this tutorial are clickable to see higher resolution versions to more easily see what the text describes. If you are new to this, I also highly recommend loading up the same tutorial map I use and try to follow along with this tutorial, exporting the same area, rather than try directly on your own map. Following along on this map lets you more easily see that things happens the way I describe them, and lets you build familiarity with the tools before starting on your own map. There is also a video accompanying this article, showing me perform the steps described herein. Note that this video is not intended as a stand-alone video tutorial, but rather as a visual aid to help you see how things are supposed to work. You do not need to watch the video to take full advantage of this article, it is completely optional. First of all, we need to start a new map to hold your zoomed in version. For this step, I recommend opening two instances of CC3+. In the first instance we load our existing map, and in the second instance we need to start a new map. As I explained above, the marked area on my map is 30 by 20 miles, which means that I should start a new map of this exact size. 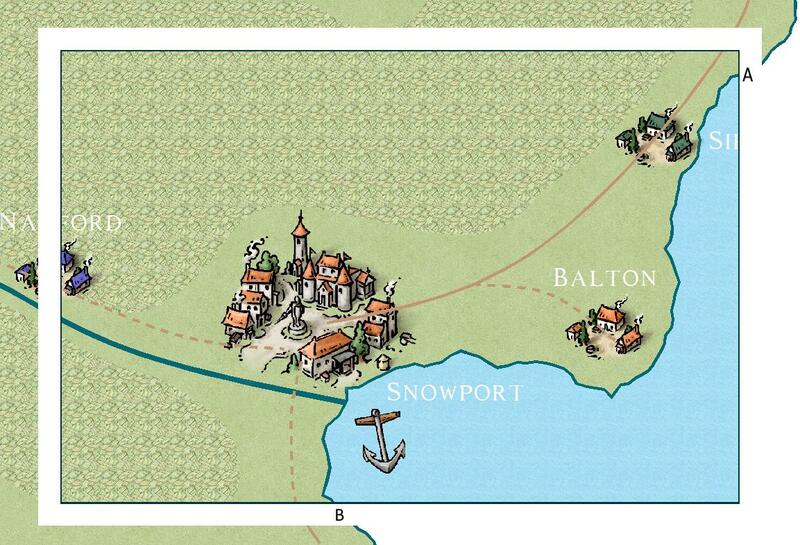 For this tutorial, we’ll also start the new map in the same map style as the existing map (CC3 Mike Schley Overland). You can use a different map style too, but this adds a few extra steps, so we’ll stick to the same style for now. The proper background for the new map depends on the area you are going to detail. 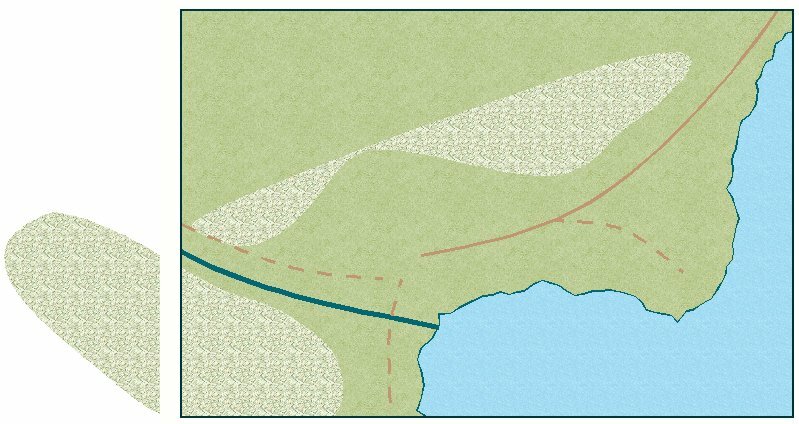 If your area contains a coastline, like in my example, you should use a sea background, but if the area was completely inland, use a land background. This choice is important because the background won’t follow along when we copy the entities. For my map and selected area, this resulted in CC3+ reporting that 21 entities were picked. 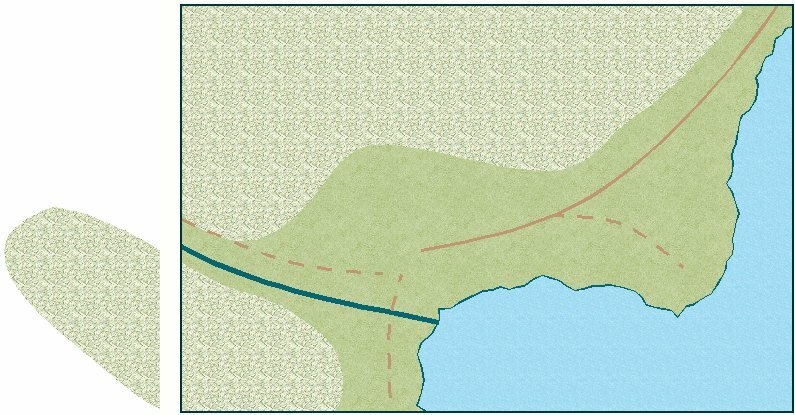 All the picked entities will also be outlined and brought to the front, clearly indicating that a bunch of symbols where selected, as well as a river and some roads that extends far beyond our area, and the main landmass itself. This looks correct to me; we’ll trim down everything when we start working on the local map, but for now, it is important to bring along everything relevant. Now, switch to the instance of CC3+ holding our fresh, blank map and use Edit -> Paste to paste in the entities copied from our old map. 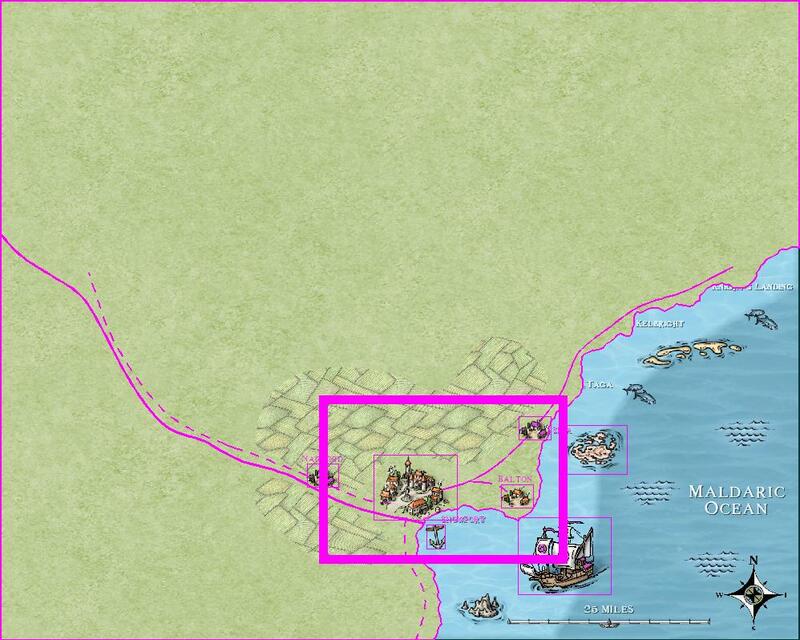 Since we specified the clipboard origin correctly above, it is now easy to position our paste correctly by just clicking in the bottom left corner of the map (or for precise placement, you can also type 0,0 and hit enter on the command line instead of clicking to place). Once you have placed the first copy, hit Esc to stop pasting, one copy is more than enough. Finally, hit the Zoom Extents button to zoom out and see everything that was pasted. As you can see, there are currently a lot of stuff outside the map border, like the landmass, rivers, and roads. Our next task will be to trim these entities. At this point you may also wonder why there is a thick white rectangle outside the map border, covering up some things. This entity is called a screen and is found on most templates. This is intended to cover up symbols and other entities that extends partly beyond the map border, making it possible for you to place a symbol at the edge of the map without it being visible outside the map. However, this screen is not large enough to cover up the gigantic section of landmass we currently have outside our map border. We could theoretically just make the screen larger, and this may be appropriate if it is just a tiny bit too small, but it is not appropriate for covering up huge areas like we have here. There are basically two methods we can use to trim down the entities. The first method is to use Trace to make a new entity and trace along the edges of the old one before finally deleting the old entity. The second method is based upon using Split and Break to remove the parts of the entity we don’t need, and then glue the remaining parts back together. Both of these methods are equally valid and while I am using both in this tutorial simply to illustrate the options, you can normally get away by only using one of them for most of the work, there is no need to think that tracing is for landmass and Split/Break for terrain features, even if that is what I use here. Before we move on, zoom back in to the actual map, we don’t need to see the full extents of the landmass extending beyond the map border right now. Also make sure effects are off, it is difficult to work if edges are being obstructed by glows and fades. We’ll start by creating a new landmass entity that traces the existing coastline. Note that the trace tool is simple to use, but it is sensitive to how you do your selections, so if you are unfamiliar with the command, make sure to follow the instructions exactly. Also, keep an eye on the command line during this process. Note that this is actually way easier than the small wall of text below seems to indicate, it is just a bit difficult to explain in few words. Once you have done this a couple of times, you’ll find that it only takes a few seconds. button in the top left. This lets us start drawing a new landmass as usual. 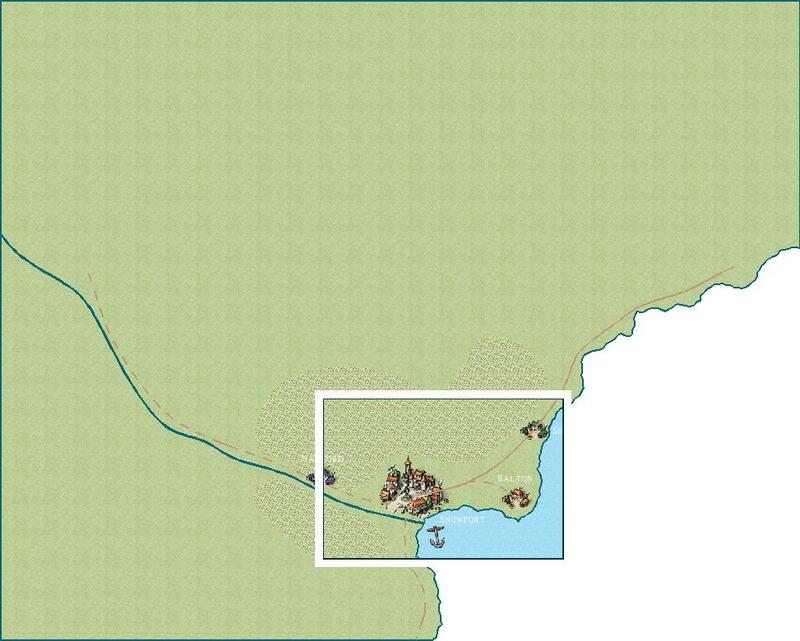 Place the first node a little outside the map border, right where the coastline exists the map border, in the position marked A on the image. Note that since drawing tools don’t draw outside the map border, this will lead to the first node being placed exactly on the border of the map. We clicked a bit outside to ensure the node would be exactly on the border, because if you manually try to position it, you might end up clicking slightly inside instead. After placing the first node, you’ll notice that the command line now offers the option T – Trace. Simply hit the T key on your keyboard to start tracing. The command line will change to ask you for the entity to trace. This entity is our landmass, so click on any point of the coastline inside the map border of the new map (The trace goes through the point you click, so it is very important that you select it inside the map border, and not along the part outside the map border that we want to remove). Once you have selected the landmass, the command line asks for the starting point. You’ll want to place this starting point immediately inside the map border, but as close to the map border as you can (remember, you can use the zoom commands while in the middle of another command). You’ll notice that since you are tracing the coastline, this point will always be on the coastline itself. Once the starting point have been placed, move your mouse down to right below where the coastline exits the map (marked B on the screenshot) and you’ll see how the preview line follows the coastline exactly. A second click right below this exit point will end the trace. Now, all you have to do is to complete the shape by placing a node in each corner (bottom left, then top left, and finally top right) before right clicking to end the command. Note that when you place the corner nodes, I recommend clicking quite a bit outside the map border to ensure that the tool follows the map border (remember that drawing tools stop at the map border, but if you try to work too close to it you may find that the fractal line sometimes extends back into your map, creating a “coastline” at the edge where none should be found. Note that if you have problems getting the line to follow the map edge after clicking the ending point at B, it helps placing a second point immediately to the left of the first one before doing the full stretch, and make sure to click outside the map border when placing this point. command and selecting the landmass at any point beyond the map border. Since only the old entity extended beyond the map border, this ensures that we don’t select our newly draw one. 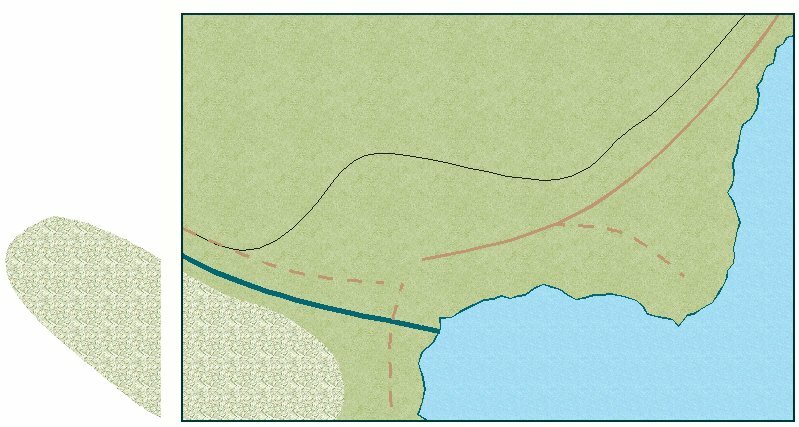 Before we start with the farmland, let us just quickly trim the roads and the rivers, making them end at the map border. Since I feel a few of the symbols in the maps are in my way, I’ll start by hiding the SYMBOLS and TEXT sheets. command. With this command active, first select the entity to trim, and then click the trim point. Everything after this point will be removed. Since the screen serves to hide up things immediately outside the map border, it is good enough to visually place this trim point at any point where the line runs beneath the screen. modifier to pick the exact point the road/river crosses the map border, but I feel this isn’t necessary right now. Note that which part of the line you keep is dependent on where you clicked on it to select it in the first place, so always select the entity to trim by clicking on a part of it you wish to keep. Keep using the trim command to trim all the road and river lines. 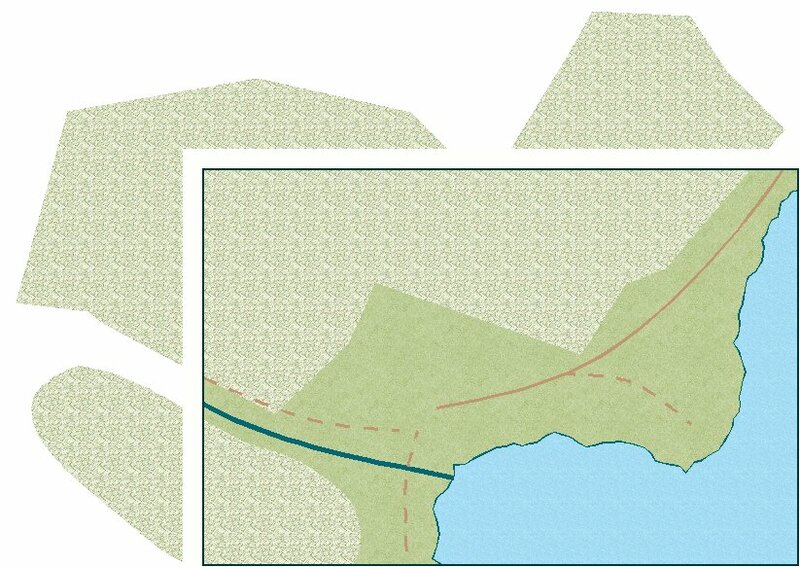 We could have traced the farmlands polygon the same way we did with our coastline, but let us explore the second option and trim it instead. 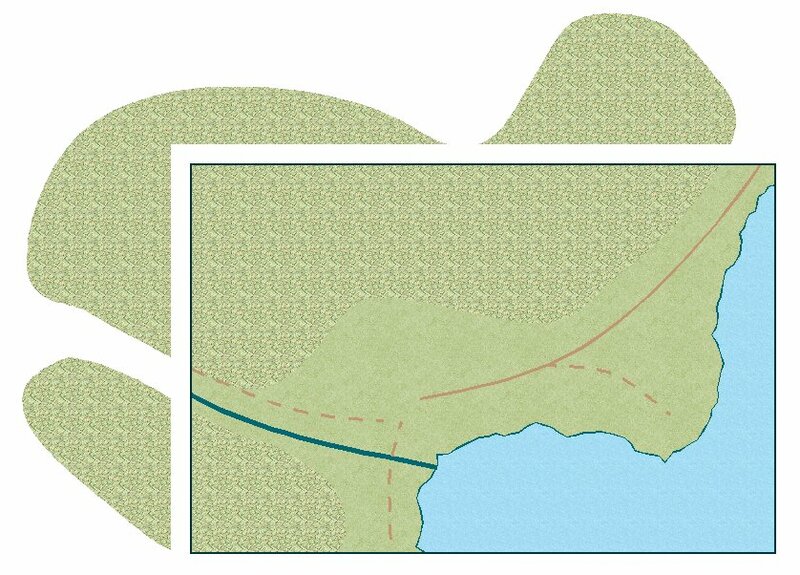 We’ll break it into several pieces and cut away the part extending beyond the map border. Now, before we start with the farmlands, I just need to point out that these are smooth polygons. I won’t go into details, but smooth polygons are rather complex because the way the position of the actual drawn path is calculated in relation to the nodes. For a straight polygon, nodes just define corners, but for smooth polygons things are more complicated. Therefore, we will need to do a few extra steps compared to a straight polygon, but since smooth polygons are common, I find it worth showing them off here. , choose the Smooth to Straight command, and use that on the northern farmlands.
. To successfully use this command to keep the parts we need, it is important that when you first select the entity to break, the selection point must be on a part of the entity you wish to keep. In this case, that means selecting it along the part that is inside our new map. After selecting the entity to break, the command line will ask you for the points where the break starts and ends. You can set these points by clicking outside the map border where the entity crosses it. Because this entity will have an edge fade effect, I actually recommend placing the cut points near the outer edge of the screen (the white border) rather than close to the map border. Make sure the cut points aren’t outside the screen though. You’ll notice when you do this that the entire polygon seems to disappear, and only a thin line is left behind. This is because when we cut away parts of the polygon, it would no longer be a closed shape. Don’t worry, we’ll easily turn it back into a polygon soon enough. We can now go back to a smooth shape. Simply right click explode, and this time, select Straight to Smooth, and use this on the line. Now, all we need to do is to turn our line back into a polygon. This is done quite simply by right clicking Explode, and selecting Path to Poly, and use this on the line from the farmlands. When you do this, you’ll notice that it turns back into a filled polygon, with the same fill as before. But it looks a bit weird, it no longer extends out to the map border as it used to. The reason for this is simply that there are no nodes there anymore. After all, before we started, there were a lot of nodes outside the actual map area, which helped define the shape. Now we are left with just the nodes inside the new map area, and there are no nodes up in the left corner. So, we need to handle this. command. 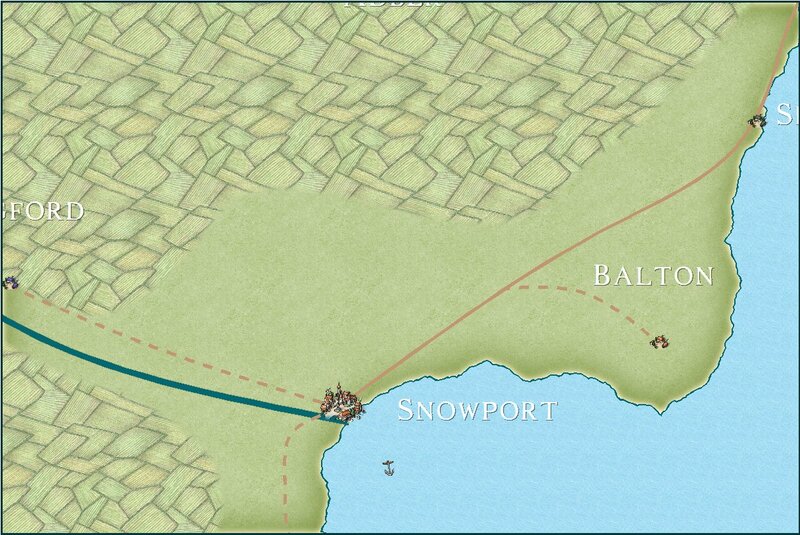 Start by placing a node in the top left corner of the map (outside the map border, but inside the screen). To use this command, start the command, then click anywhere along the upper edge of the farmland polygon, and then click in the upper left corner. You’ll note that it still doesn’t fill properly, the reason for this is how smooth polygons works. The easy fix for this is to just add yet another node in the top left corner, as two nodes very close is the recipe for making sharp corners with smooth polys. Similarly, you’ll need to add one more node at the edge where the polygon “exits” the map. There is already one node there, the position should be pretty obvious when you use Insert Node near it. For a straight polygon, the only node we would need to place is a single one in the top left corner. Now, do the same to the bottom farmland poly. The symbols are probably way to large for your new map. There are two basic ways for handling this, either simply delete them and place new symbols, or use Symbols -> Scale Symbols in map to change the scale of the existing symbols. You may find that the fills are not scaled the way you want. For example, I think the scale of the farmland fill is now way to small. This is easy to fix though, simply click the fill style indicator in the status bar, go to the Bitmap Files tab, select the relevant fill, and change the values for Scaled. Increase these values to make it appear larger in the map. When following the guide above, the entities will be identical to those in the original map. 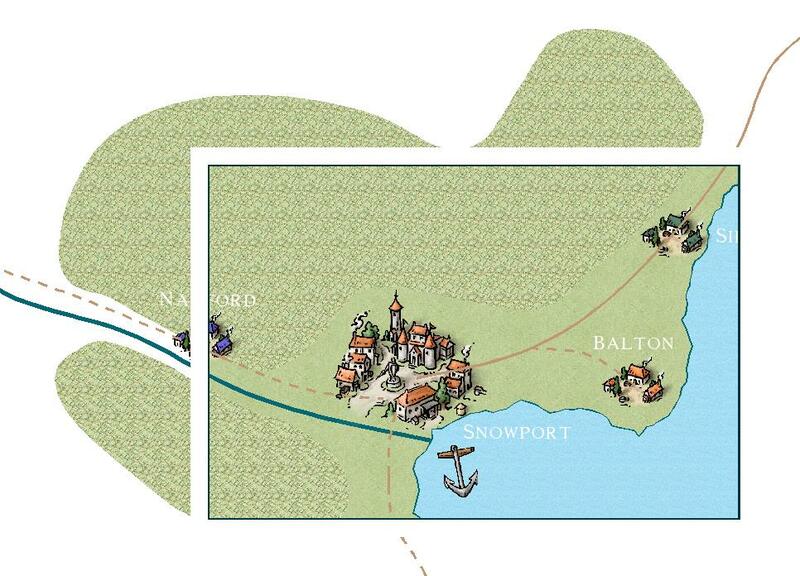 However, when you create a local map, you’ll often want to add more details to things such as the coastline. There are two main methods for doing this. The first is to use the edit functionality of the drawing tools. You’ll notice that when you activate a drawing tool, such as the default landmass one, before you place any nodes, the command line will offer you the option to hit e (for edit), which allows you to edit an existing entity. See page 58 of the CC3+ user manual for more details about this. command. Using this on a coastline is a three-step process. First, delete the outline from the landmass. This is needed because the outline is a separate entity, and fractalize cannot do two entities at once. Then, use the fractalize command on the landmass. I recommend not setting depth to more than 1 or 2.
button, and select the Change Like Draw Tool option. Right click to bring up the drawing tool selector, select the Land, Default tool and when asked to select entities, select your landmass and Do It. This will turn the landmass back into a “proper” landmass and reapply the outline we deleted earlier. to delete these extra nodes and bring things back to normal. Below is our finished map. Still lots of things to do with it of course, but we are done importing the features from our regional map. The next steps are just “regular” mapping to add all the additional detail you would see at this new map level. Sometimes, we don’t need to have exact copies of our entities, we just want to make sure things match up reasonably accurate. In these cases, it can often be simpler to just export the relevant part of the original map as an image (File -> Save As -> Choose Rectangular section PNG as the file type). Then, in the new map, make a temporary sheet to hold this image, and then import it into the map using Draw -> Insert file. Now, you can keep this image in the background and simply draw over it using the various tools. 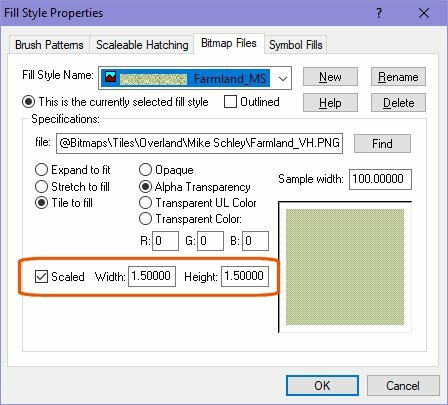 As you work, simply change the position of this temporary sheet in your sheet order so you can always see the image properly, without it being obstructed by entities you have already drawn, such as the landmass. Depending on the map in questions, this can be a faster method than those described above, but at a cost in accuracy. Then again, since you usually plan to add more details to the entities anyway, this might not really be an issue for you at all.